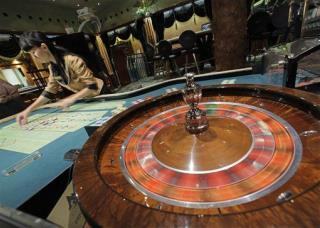 (Newser) – Scientists have unlocked a key to obsessive gambling—the lure of the near miss. In search of the reason gamblers keep playing even after strings of horrible losses, Cambridge University researchers examined the brains of gamblers. They found that a near miss—putting a bet on a horse that finished second, for example—stimulates areas of the brain nearly identical to those that respond to winning. The reason has to do with our fundamental learning mechanisms, LiveScience reports. "A near miss is a signal that you're acquiring the skill, so it makes sense that your brain processes them as if they were a win," explains the lead researcher. "In a game of skill like soccer, a near miss might be hitting the post or cross bar." The problem is that gamblers' brains are confusing games of chance—in which near misses don't predict future success—with games of skill, and that keeps them returning to the table. Deebles you just made so many assumptions it is staggering. I think every one was incorrect. """"a drug addict doesn't go forth from a near miss"""" NOSHIT. They go forth having just hit a "homerun". Therefore, they want to do it again. At the same time, some become addicted to feeling like shait. Gambling addictions are practically the same as drug ones, same brain mechanisms involved. NDT, I gotta ask.....how do you keep getting a blank post to come up? There've been plenty of times that I've hit "submit" on a blank post for one reason or another, but it tells me I have to right sumptin' first.....thankfully.